Working out regularly is great for your body, mind, and soul. Getting to the gym on a regular basis, though, isn’t always easy, and when you do get there, you’re often competing with others for a turn on your favorite workout machines. An elliptical trainer offers a fantastic workout that employs both your arms and legs, building muscle from top to bottom while increasing your fitness and health levels overall. We looked at the elliptical trainer from Fitnex to see if it could be the home gym you’re looking for. Fitnex provides premium quality equipment that is engineered and tested by one of the most experienced manufacturers in the market. They aim to bring you commercial-grade equipment, at prices that represent true value for the business and home consumer. This product is suitable for anyone who is looking to enjoy an all-over-body workout in the comfort of their own home. It is a versatile piece of equipment that is suitable for all fitness and skill levels. Elliptical trainers offer a low impact workout meaning they are perfect if you are hoping to keep stress and strain off your joints while building muscle and improving cardiovascular health. When your new elliptical trainer arrives, it will require some assembly so you should expect it to arrive in several pieces along with bolts to put it all together. Printed instructions are also included in the package. Elliptical trainers offer the opportunity to work out both your upper and lower body at the same time. The equipment has moving arms to give your arms, shoulders, and chest a great workout, while the leg action is like a step trainer, similar to the exercise you would experience while walking, skiing, or running. If the whole-body workout is too tiring, then you also have stationary handlebars that you can hold on to for balance while you exercise your lower body only. This is a very quiet exercise machine, so it is really easy to listen to music, watch TV, or talk with your family while working out. The performance console on the Fitnex E70 is great, as well as easy to use and lots of choices when it comes to resistance and workout programs. For example, 16 different resistance levels will give you plenty to work up to regarding endurance and strength training. Also, a variety of workout modes that include race, weight loss, and a quick-start manual function, among others are included. There are also eight built-in programs that you can try out. Some people have mentioned that the programs are quite tough to follow, so depending on your fitness level when you start working out with this machine, they may be too much of a challenge. While you’re working out, the console will also give you tons of feedback on how you are doing. Some of the metrics provided include time spent exercising, your current work level, distance (theoretically) traveled, speed, heart rate, and calories burned. For the price range, this trainer falls as an extremely well-built, solid machine. Users have commented on how smooth the step trainer action is and how safe they feel on the machine due to its sturdiness. There’s nothing worse than a cheap-feeling exercise machine that wobbles around when you’re trying to get into an intense workout! 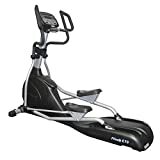 Fitnex has obviously built this elliptical trainer to last as they offer a fantastic warranty package along with each purchase. The frame itself is covered for a lifetime, the electronics and parts are under warranty for three years, and any other parts are covered for two years. Unfortunately, this piece of equipment is quite large and heavy, and you don’t have the option to fold it away for transportation or storage when you’re not using it. You need to make sure that its size can be accommodated in your home. The dimensions of this trainer are 73 inches long by 21 inches wide so be sure that you have the space available before investing. If you can accommodate this elliptical trainer’s proportions, then you’ll find that it is suitable for anyone and everyone. It has extra-wide foot pedals to ensure maximum comfort for all users, and it is a really great workout for aging joints due to the low impact nature of the exercise it offers. The machine is also incredibly strong, supporting up to 400 pounds in weight. The machine is quite heavy (220 pounds), so when you assemble it, it is best that you do so in the spot that you actually plan on using it. Whether that is facing a television or a window once assembled, the machine is difficult to move about. This elliptical trainer also has so many different workout modes available, so we suggest that you try them all out to see which you like the best. You can also vary your workouts throughout the week, switching between more intense muscle building programs and longer endurance training programs, so that you don’t get bored. 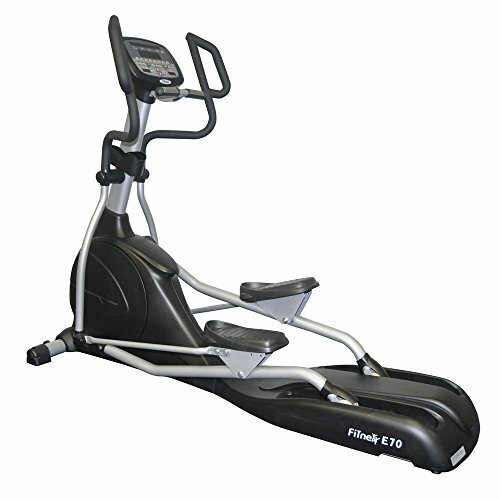 If you love the idea of having an elliptical trainer but just don’t have the space to accommodate this one from Fitnex, then you should consider the Nautilus E614 Elliptical Trainer. It takes up considerably less floor space (the dimensions are 50 x 34 x 22 inches), and it’s quite a bit cheaper too. It’s great value for money as it offers a lot of really fantastic features such as 20 resistance levels and 22 different programs, as well as built-in speakers so that you can plug in your phone to play music wherever you are in the house. While this is quite a sturdy machine for the money, there is some movement when exercising. There is also no mention of a warranty of any kind. Well, as with most things in life, you get what you pay for. The built-in speakers on the elliptical trainer from Nautilus are a nice touch, but we feel that they wouldn’t be needed since, at home, it’s likely that you’ll always have access to your music, whether it be through your home entertainment center or headphones. Nonetheless, if you are on a budget, this is a great option. The sturdiness of the machine from Fitnex makes it a top pick, and while it is obviously built with durable parts that contribute to how solid and stable it feels, it is also supported by the larger base size. Also, we’re suckers for good warranties. Yes, this elliptical trainer is a bit expensive, but it’s a one-time investment for many years to come, and we think by spending more now, you’ll be saving money in the long-run.